Whole Milk Powder with Soluble Coffee. NESCAFE Dolce Gusto Cafe au lait. A combination of intense coffee and smooth milk in one capsule. Best served in a mug (at 180ml). Discover NESCAFÉ® Dolce Gusto® Café au Lait, a harmonious balance of intense coffee and smooth milk, already prepared in a single capsule, for you to enjoy perfect mug-sized coffee (180 ml) in a minute. 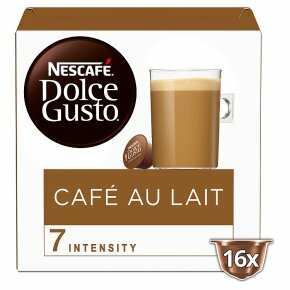 The box contains 16 capsules designed for NESCAFÉ® Dolce Gusto®' capsule coffee machines for you to prepare 16 mugs of Café au Lait. Easy to Prepare Simply slide your Café au Lait capsule into your NESCAFÉ® Dolce Gusto® machine. Your coffee will be ready right away.